When traveling to a new city, what do you usually do first to find cool places to go to? Usually, you ask your friends. Mobissimo, a travel search engine, launches their social network MobiFriends today as an on-site widget. Mobissimo searches 180 travel sites in over 30 countries, to offer users the lowest fare possible. Through MobiFriends, Mobissimo hopes to offer users a comprehensive travel network where users can connect and maximize on their travel experience. Users can access MobiFriends from the widget on their personal dashboard, or on the search results page. The widget shows users their friends’ upcoming travel plans, recently reviewed locations, and their friends’ suggestions for favorite hotels, restaurants and activities in the location. Users are also able to share cheap fares, travel plans and favorite places with their friends through Twitter or Facebook. Mobissimo offers several travel-related on-site modules while searching, kind of like a personalized homepage. 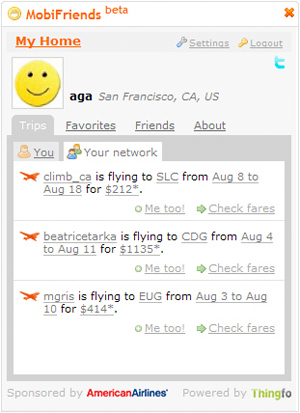 It has modules with travel blog headlines, popular fares, alternate locations, and now MobiFriends. Users can add or remove these modules and drag and drop them where they wish. Mobissimo has several competitors in the travel search space, like Kayak and UpTake. While both sites offer reviews for locations, they lack the personal social network feature of MobiFriends. Reviews are extremely helpful, but they don’t compare to friends’ opinions. There has been heavy competition between the travel search sites, but maybe this is the kind of feature that will set Mobissimo apart. We’ve recently reviewed Mobissimo and how it stacks up against Kayak.